This lesson is absolutely brilhant and rare to find in such format and rich content. However, if I may further ask, there could be more details on how the Meteorologists predict specific weather conditions such as snow, low ceiling, visibility using surface observations, satellite products and numerical weather prediction models in conjunction. One cloud also use some tips on which parameters are more reliable and more relevant to forecast each type of weather condition. Finally, the lesson must be updated since it dates back to 2007. Congratulation on the initiative and best regards to the COMET Team! I enjoy learning about parts of the planet I might never visit. It was hard to find some answers to the questions. I would appreciate the ability to use captions in the lectures. This is because sometimes it is hard to understand the interviewees speech and it is easier to capture the specific terminology spoken. It was outdated and I would like subtitles to the videos. I learned a lot from this lesson that I had never knew about the Antarctic. I found this absolutely fascinating. There is so much not yet known and the risks involved in the studies are commendable. I like the lesson it was interesting and I learned a lot. it was a good lesson. i learned new stuff that i didn't know about before. Lesson very well crafted and presented. Good information. Mobile friendly navigation is needed, as well as making sure all the quiz material is covered in the transcript. It was lengthy and a bit confusing. it was very useful for me, because I have challenge with it to find the correct answer it takes me about more than 3 hours, and I have excited to solve the problem. generally, it was interesting for me. 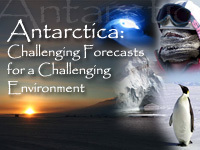 Really good introduction to Antarctic forecasting and how things work in Antarctica. I'll be recommending the unit as an introduction to people who have not been south before. I liked how short and synthesized the material was however some parts were too fast for me so captions would help more. greenhouse gases, emissions, reductions, our polar regions, ice caps, are all important to our future generations to come. This module is definately an education. The Antarctic plays a key role in global weather, but is overlooked by most of the world. This extreme cold, dry and windy part of the earth is an outpost for a group of scientists and a support team looking for the answers in a quest to determine and mitigate global warming. Once merely a curiosity for exploration, it is now a focus for those studying meteorology. The stability of atmospheric and ocean currents are connected to this harsh outpost of the world. This module provides key details on how the Antarctic weather and its scientists are paramount to the future of our earth. 1. Give the general audience a basic understanding of the uniqueness of Antarctica. 2. Give prospective Antarctic forecasters or meteorology students an understanding of the challenges in forecasting weather in Antarctica. 3. Provide students an overview of the tools used to monitor and forecast Antarctica’s weather. 4. Describe the connection of Antarctica with the rest of the earth’s climate system and the research that seeks to discover how it influences that system. July 2014: The AMPS model resolutions shown in this lesson are dated, but the points made remain valid. The web links in Section 5 no longer work, but the core material of this lesson is still solid.